Sleep patterns are determined by one‘s chronotype, says Till Roenneberg, and everyone should be allowed to follow its dictates. Here he discusses ways to achieve this goal and outlines the benefits it would bring. It’s three o‘clock in the afternoon and Till Roenneberg has just given a lecture. It’s a good time to talk to a chronobiologist about the biological clock – the mechanism that synchronizes the metabolic operations in our bodies with the light-dark cycle and the changing seasons. It turns out that individuals vary in the diurnal timing of their metabolic processes, and can be classified on this basis into a number of ‘chronotypes’. When allowed to follow our natural rhythms, some of us are early birds, some are night owls, and the rest fall somewhere in between. Roenneberg himself is more of a night owl, so he doesn’t like giving interviews early in the day. But now he has taken the time to explain the wider significance of chronobiology, which came to prominence when three pioneers in the field won the 2017 Nobel Prize in Medicine. The medical implications of the circadian clock are the central theme of the upcoming conference on “The Role of Circadian Biology in Preventing and Treating Pathology”, which Roenneberg helped to organize. Professor Roenneberg, what does the biological clock actually do? Roenneberg: There is virtually no bodily function that does not show a circadian rhythm. The biological clock regulates essentially all of the organism’s internal processes – from the concentrations of calcium, magnesium or potassium in the blood to the presence or absence of specific enzymes in cells. The conference next week will look at the role of these biological rhythms in disease states. Why now? Roenneberg: We must get to the point where the clinical significance of the circadian clock receives the attention it deserves. It must be assumed that every clinical intervention and every measurement of a clinical parameter is subject to circadian variation. When a doctor administers a drug that inhibits an enzyme without knowing when the enzyme reaches its peak concentration, he must use a very high dose of the therapeutic agent. But if the drug is given at the right time of the day one can minimize both the dose and the side-effects, while maximizing the desired effect. Let’s take another example: A patient is told to come in at eight in the morning – before breakfast. In industrial societies, we now find differences of up to 12 hours between the different chronotypes. If one takes blood samples from an extreme early bird and an extreme night owl at eight in the morning, the first has already been up for several hours, while the other is physiologically still in his/her internal night. Therefore, one will find differences between the two that have nothing to do with the patient’s state of health. We therefore must ensure, that every physician has the tools necessary to determine each patient’s chronotype in the simplest possible way. These are only examples of things that must be taken into account. Does the biological clock also play a role in psychiatric disease and psychotherapy? Roenneberg: A study preformed in England recently published that night owls are overrepresented among patients with psychiatric illnesses. There are two conclusions one can draw from this finding. 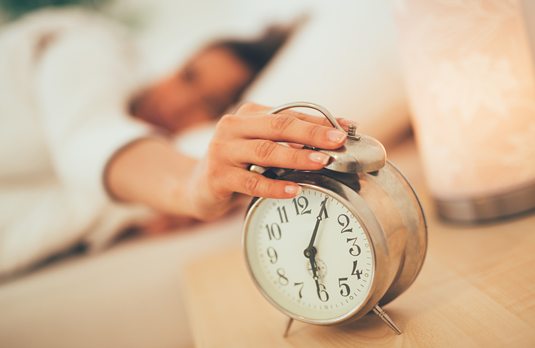 (1) The late chronotype may be intrinsically at greater risk of developing mental illnesses or (2) a lifestyle associated with being a late chronotype, such as having to get up early in the morning with the help of an alarm clock may foster the greater risk. Unfortunately, this paper does not discuss these alternatives. As yet, we know very little about the underlying causalities – we still have a lot to learn. But we do know that changes in sleeping patterns are associated with psychiatric symptoms. I believe that most of the health consequences of a lifestyle that is in conflict with the circadian clock result from changes in sleep behaviour. However, in order to pin these effects down, and work with the biological clock in the context of therapy, we researchers need to agree on certain methodological standards. Establishing meaningful definitions and establishing appropriate standards: That is how Roenneberg sees his role in translating chronobiological insights into clinical practice. At the conference he and other leading chronobiologists from all over the world hope to establish the basis for such an endeavor. One aim is to clear up the confusion caused by the diversity of methodologies in the field. Why is it necessary, he asks pointedly, to keep designing new survey questionnaires for chronobiological studies? Surely it should be possible to agree on a single form that captures the basic parameters. Another urgent goal is to set up databases to make raw research data available to the research community. For Roenneberg, this is a basic prerequisite for understanding how the biological clock functions in any given context – not only in disease states but also in our everyday lives, at work or in school. In his own research Roenneberg has repeatedly shown that, by imposing a standard social schedule, modern society forces the different chronotypes into a ‘one-size-fits-all’ framework which brings many people into conflict with their biological clocks. He has coined the term ‘social jetlag’ to describe this physiological dissonance, which affects up to 80% of the population to a greater or lesser extent. Their natural sleep rhythms are out of synch with the demands of their daily lives. Moreover, these constraints begin early in life. Traditional school schedules mean that children are not in the classroom at the time of day when their brains are most receptive for new information, and best able to process and retain it. Starting school at eight in the morning is absurd, especially for adolescents. It is now known that a person’s chronotype changes with age, getting later as we grow up before peaking in one’s early 20s and then going into reverse. This means that teenagers are real night owls. Roenneberg’s colleague Martha Merrow has recently shown that the one-size-fits-all mindset puts night owls at a significant disadvantage. Her study demonstrated that night owls perform worse in school tests taken in the morning than do the early birds. Meanwhile Roenneberg is running a pilot project in a school in the Rhineland to determine whether pupils benefit from a more flexible school timetable. Although so much is now known about the biological clock, very few people seem to succeed in ‘tuning’ their lifestyles to their chronotype. Do you find this frustrating? Roenneberg: I don’t see things quite so negatively. Most people now get up much later than earlier generations did, certainly in comparison with the hours that farmers had to put in not so very long ago. Nevertheless, you’re right. With regard to our internal clock settings, we still get up too early – otherwise 80% of us wouldn’t need to set the alarm on workdays. The reason for this is how we expose ourselves to light. The pervasive use of artificial light ensures that it never gets really dark, even in the middle of the night. Furthermore, most people spend most of their day indoors, and they don’t get enough exposure to natural light. The result is that our internal clocks, which synchronize to light, must be set later in order to oscillate with a 24-hour rhythm. Not only do people go to bed later, but the last thing many of them do before turning in is to check their mails – which is not likely to help them get to sleep. Roenneberg: Our society behaves in a schizophrenic way. On the one hand, we have shiftwork because the machines have to be kept going 24 hours a day, and we want to be on the go globally 24/7. Despite all that, we persist in the belief that anyone who is not at work by nine is lazy. I tell my staff and my coworkers – for egoistic reasons – that they shouldn’t set the alarm clock. I want them to give of their best at work, so they should be asleep when their bodies say so. That reduces sickdays, and everybody is more productive and happier. You have shown experimentally that social jetlag can be mitigated when working hours are compatible with the individual’s chronotype. Do their employers also benefit? Roenneberg: Companies benefit when they make it possible for their employees to take their rest at the times when they need it most. When I speak to employees during our field studies, some say “I prefer to go to work tired and be wide awake in my free time.” These people work only because they have to earn a living, not because they find any satisfaction in doing their jobs. For this reason, personal autonomy – especially the ability to choose when to work and when to rest – is important for the maintenance of their mental and physical health. Employers in Germany lose billions because their employees come into work too early, in an essentially non-productive state, and have to have a cup of coffee before they can get anything done. Apropos money ... One of Roenneberg‘s most pressing tasks is to convince politicians and decision-makers how much they would save if they would only pay more attention to the role of the biological clock in social life. It is estimated that, by enhancing individual performance and reducing days lost due to sick leave, flexible scheduling could boost productivity by between 2 and 3% of GDP. – And then there are the positive effects on commuter stress. At this point, Roenneberg jumps from his chair and begins to draw curves on the whiteboard to demonstrate the impact of flexible working hours on commuter travel times: Traffic congestion during rush hours would become a thing of the past – if everyone could choose her own work schedule. But is it practically possible to organize things such that everyone can get the sleep they need when their circadian clocks say so? Roenneberg: In terms of the timing of their sleep periods, there is considerable overlap between the majority of individuals. It is just question of enabling them to conduct their lives in accordance with their own particular cycles. It may take a bit of rethinking, but it can be done. “Yes we can”. On May 6-8, 2018 the world’s leading chronobiologists will attend an international conference at LMU. In brief 10-minute talks, specialists in various disciplines will present their latest findings, consider future challenges, and discuss their social implications. The Keynote Lecture will be given by Professor Anna Wirz-Justice of the Center for Chronobiology at Basel University. LMU chronobiologists Till Roenneberg and Eva Winnebeck have developed a facile method that allows them to record the dynamics of sleep under natural conditions. In the first field study of its kind, LMU chronobiologists found that adapting shift schedules to chronotype improves sleep and reduces social jetlag.